When Samantha Antonietti was accepted to Connecticut's Sacred Heart University last spring, her parents sat her down for a talk. "We had a family meeting about how I was going to pay back all the student loans," says Antonietti, whose family lives in New Jersey. "It felt like a financial cloud hanging over my head." Pay for performance is not an entirely new concept  public schools in New York City have started paying students up to $50 for scoring well on standardized tests, and other school districts are experimenting with giving gift certificates to top-performing students. But GradeFund puts the rewards in students' hands. Or rather, in their friends' and families' hands. The site is akin to Facebook in that it lets students create a profile and send out invitations asking for sponsors to pledge whatever they please for each A  $1, $2 or more. Sponsors can also donate by subject area, giving money to students who ace, say, organic chemistry or film studies. For example, ZooToo.com, a website for pet enthusiasts, is GradeFund's first corporate sponsor, pledging $15 to the first 100 students each semester who submit proof that they have earned an A in veterinary medicine. 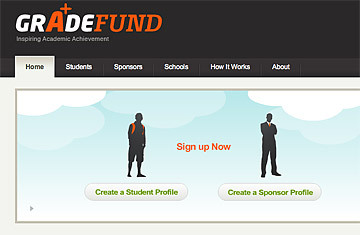 In the weeks since the site launched, Antonietti has busily sent out GradeFund invites. "I've asked relatives, friends of the family, teachers I've had in previous years," she says. So far, she has 15 donors who've pledged $10 per A. The money could add up: if she gets straight A's in her five classes, she'll earn $750 a semester. Kopko recognizes that this is small potatoes, considering that many students are accumulating debt at a rate of $20,000 and up a year. "Our service doesn't solve the problem, but it's a step down that path," he says. After the article ran, a media whirlwind ensued, and Kopko appeared on the Daily Show and was quoted in the New York Times. DormAid took off and is now available on more than 65 college campuses. The company is valued at about $3 million. Like DormAid, GradeFund has arrived amid raised eyebrows. Isn't it supporting the wealthiest students rather than the neediest? (Kopko says a range of students are signing up.) Couldn't students use the money to just buy pizza? (Donors can have checks sent to the tuition office rather than directly to the student.) And won't it encourage students to obsess even more about grades? Kopko isn't worried. "So far, the closest thing I've gotten to a critique was an administrator at Adelphi University who posed the question, "Might this increase the incentives for cheating?'" he says. "I think the incentive's always there. GradeFund won't change that." But he hopes GradeFund will change students' motivation level. "We're setting up small, little carrots," he says. "Let's say there's a seventh-grader who is contemplating cutting class with his friends. If he has $100 on the line, maybe he'll go to class." And if he's really on the ball, maybe one day he'll realize that GradeFund's 5% transaction fees amount to a pretty hefty commission.